There is only one Egyptian entree that I have found just in Egypt and nowhere else in the world, and that is koshary. 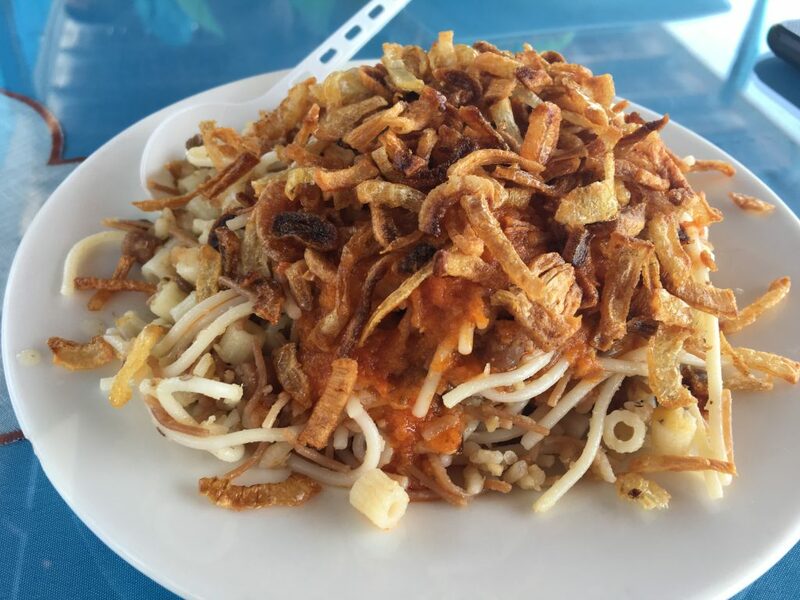 This dish is made of rice, noodles, lentils and tomatoes with slivers of fried onions sprinkled on top, giving the hot, slightly spicy bowl a bit of crispiness. 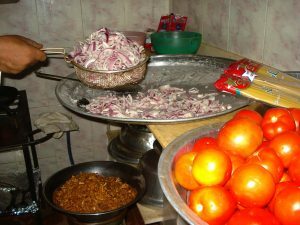 My favorite koshary is in the South Sinai town of Dahab, and by far the most popular koshary in Dahab is made by a man named Ali. He invited me to his home one night to see how he does it. 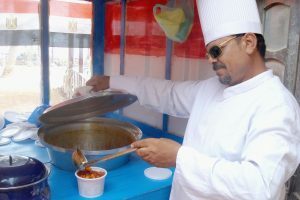 In Dahab, koshary is not found in restaurants but is sold as street food. 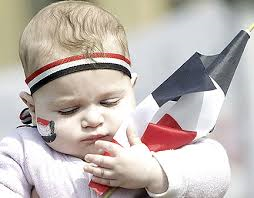 Many days of the week you can see Ali pushing through the streets a small blue cart decorated with the Egyptian flag, his koshary kept warm in a metal vat. Ali begins his koshary walk in the late morning every day except for the Muslim holy day of Friday, and he stops whenever he runs out. Or whenever he feels like stopping. Because this is Dahab, Egypt after all, where life is very easy and time is whatever you want it to be. When Ali invited me to his home to watch him cook koshary, I knew the language of directions in Asalah but not well enough to find his house. I ended up in one of the district’s many closet-sized supermarkets and told the owner I was looking for “Ali koshary.” The man nodded in understanding and called Ali, who sent his smiling pre-teen daughter to come find me and lead me down the dark, empty streets of sand to their home. I said hello to Ali’s wife and children, sitting on cushions on the living room floor watching television, as Ali led me to the kitchen, where I sat on the floor to watch him cook. In the Bedouin culture people sit on the floor and the ground, not on sofas and chairs. 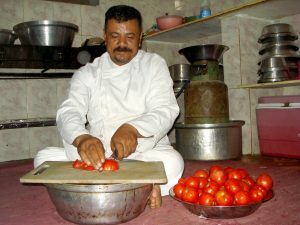 Ali has been making koshary in Dahab for almost 25 years. We talked as I watched him boil onions and slice tomatoes, and after a while he fed me another meal he’d already cooked of lamb and vegetables and rice. 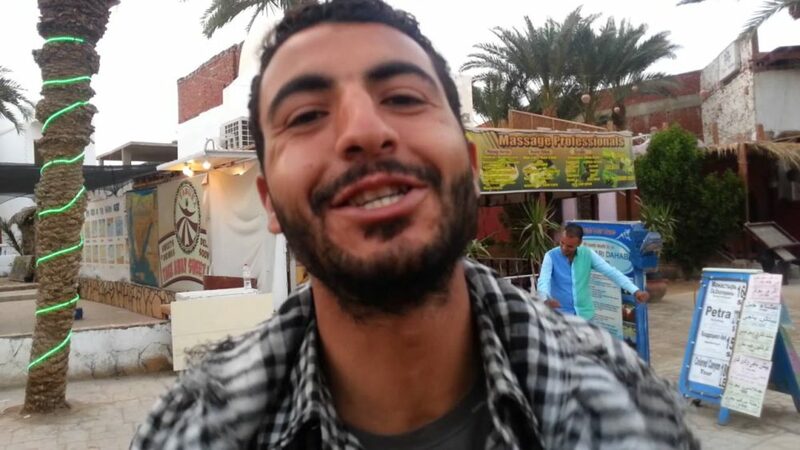 The few hours I spent watching the creation of the most popular koshary in Dahab is a short portion of the time Ali spends cooking almost every night. Since Ali makes koshary for the masses, any recipe he uses is multiplied by at least 25. If you want to try it yourself, here’s a recipe for a regular portion of this Egyptian dish.